We’ve reported on DYMO’s products before, and while the LabelManager 360D may not be the LabelWriter 450 Twin Turbo, at least it’s not the Rhino 101. DYMO’s products are made for those who just have to have a label on everything, and the LabelManager 360D is ready to work. It has a QWERTY keyboard with a 40 x 70mm screen to display two lines of text. The 360D uses DYMO D1 labels in and 6, 9, 12, 19 mm widths, and these label cartridges simply snap conveniently in place in the back. It also has a lithium-ion battery that is the same type used in cell phones and laptops, which allows you to take the 360D anywhere for wireless work. The user doesn’t have to be dependent on AA or any kind of batteries, just an occasional recharge with the included AC cord. 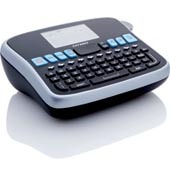 The user can save up to nine different labels in its save text feature, and the 360D is very good at printing exactly what has been typed in the screen. I got a chance to try it out, and it worked very well from right out of the box. The user has the option of typing in 3 fonts and 7 text styles, as well as highlighting what he or she has written with 8 box styles or underlining. If you need one of these for your home or office, head on over to the DYMO site and find a convenient place near you to buy them. The going price for it on Amazon is about $66.24.